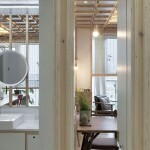 Wang Tiantian and Luo Yaqin places a fragment of a garden in an ordinary apartment. Before having a chance to design a house of our own, various imaginations about it emerged in our minds. The real beginning of design called for an appropriate start which was somehow incidental. 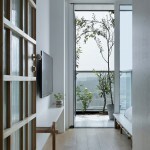 As architects sharing the interest in Chinese gardens of Jiangnan, Yaqin and I arrived at the idea of embedding “Cui Linglong”, a house in the Surging Waves Pavilion Garden in Suzhou, in an 80㎡ apartment typical in modern China. Thus, a garden is no longer just a garden and an apartment is no longer just an apartment, then what will it become of? Initially we were not quite clear about it, and we only know that this is an interesting start. A creator of gardens places a hill in a yard, modifying it and turning it into his or her habitat and a dialogist. 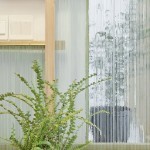 Similarly , we placed a fragment of a garden in an ordinary apartment, modifying it ，trying to live in it and talk to it. This presupposition started a living experiment and also determined how we would relate to tradition. For many people, Cui Linglong is probably just an image implying an even lattice window through which the green of dense bamboos fully occupied one’s sight, while for us it represents some specific space structure exiting in Song Dynasty. 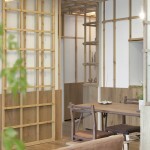 Each of the three rooms is square, connected with one another by the corner, which provides the widest view in each room. 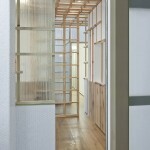 Such connection provides a zigzag space, which brings about experience that is not available in any one single room. Room-oriented residential pattern has become dominant in contemporary Chinese cities. Meanwhile, many young people can hardly afford an apartment, not to mention building a home in a sense beyond mere interior decoration. In such conditions,I appreciate my parents very much for buying us an apartment of two bedrooms and one living room in Hangzhou, which put an end to our years of unsettled life. 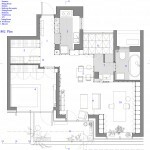 According to the apartment’s original plan, it included three rooms in the south, two bedrooms and a living room; and a kitchen, a bathroom and a small study room are in the north. In a word, the program is reasonable in its convenience and efficiency. However, the premise of such reasonableness is that we’ve got used to an oversimplified living mode in which life is reduced to bald behaviors like watching TV, having meals or sleep, etc, each relating to a clearly defined room. We hoped all the constraints in urban life won’t extend to our home. What we intended to do was to structurally challenge the current presupposition of such reasonableness and bring more freedom, easiness and fun to our home, all of which have nothing to do with styles. To some degree, to construct a garden is to is to loosen the rigid living mode, for more or less there would be some ambition to transcend daily routines in a literati’s mind. 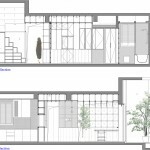 The Cui Linglong structure somehow defies the conventional way of dividing rooms by functions, as it can be regarded as either three small independent rooms or a big room of continuity but neither a gather of unrelated rooms nor a large monotonous space. 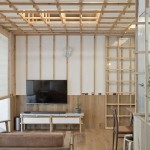 According to the original plan, we drew out a transformed Cui Linglong which extends from the entrance in the northwest to the southeast end, connecting the two most remote points in the apartment zigzagly. Entering the apartment, scenes open up continuously from the narrow hallway to the corner for reading or working in the southeast, with light getting brighter and brighter. 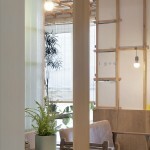 Cui linglong spontaneously divides the whole space into rather open parts and some relatively enclosed spaces. Inside the Cui linglong there is the open space. 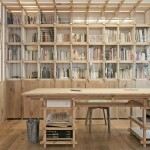 Actually it’s agreeable to sit, read, entertain guests ， have meals or work anywhere in this structure, for alterations of furniture’s arrangement can accommodate the space to different purposes. 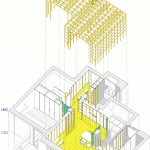 1 A bed-size bedroom, 2 A two-floor room with each floor’s clear height less than 1.8m. Irregular spaces that bring about fun are common in a traditional Chinese garden. In our home, similar unusualness arises from a full utilization of space, and visitors always find these two rooms most intriguing. Thus, however small our home is, it never fails to offer a chance to play. 1 To leave enough space for the open area, the bedroom in the north is reduced to a double bed’s size, which makes it look like a piece of furniture, while with its south-facing windows and door all opened, it gives the impression of a small house; and when all are closed, it turns out to be an adyta, making it difficult for visitors to find out how to enter it. 2 Our apartment is on the top floor, what is special here is that in the area of the original dining room the clear height is 3.6m while it’s only 2.8m elsewhere in this apartment or on other floors. Taking the advantage of this accidental particularity, we have designed a double-floor space in which there is a 500mm wide and 50° angular stair leading from the changing room on the first floor to the functionally undefined room on the second(it’s suitable for storage, napping, or meditating). Unobservant people will at first be surprised by the stair, wondering whether such small an apartment should contain a second floor, only to find out that it can’t be any smaller upstairs. There’s a quote from Six Chapters of a Floating Life, saying “Let a door lead into a blind courtyard”, and what we’ve done can be described as “Set a stairway within a quite confined garret”. 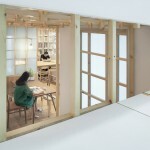 ▼ 单层净高不到1.8米的二层小楼，a two-floor room with each floor’s clear height less than 1.9m. The full-covering suspended ceiling abruptly reduces the space height and thus makes us uneasy, while total exposure is somehow inconsistent with the atmosphere of a sweet home. Apart from exposing ceilings directly, the conventional way of dealing with intrusions of ceilings, such as beams and air-conditioner’s output draughts, is to cover them with a suspended ceiling. 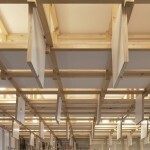 As a concept, Cui Linglong unified the three independent rooms, yet the beams protruding from the ceiling were still revealing the original divisions, thus further details were required to turn the abstractness of Cui Linglong perceptible. We felt like a compromise that the suspended ceiling should be between the two extremes, so that it could on the one hand present the shape of Cui Linglong as a whole, and on the other reveal the original height. So we have come up with the idea of three-dimensional grids. 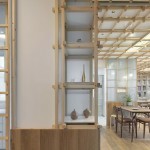 We have conceived of an orthometrical wooden system with the unit measurement of 360mm×360mm×360mm, covering the whole Cui Linglong structure and extending from the top as suspended ceiling to walls as bookshelves, cabinets, doors or bracket lamps, and even to the space as furniture. When installation of the suspended ceiling began to take shape, we found the air-conditioner and pipelines above inadequately covered. So there should be some modification, but what? 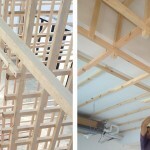 After quite some brains-racking time, we have finally conceived of an operable suspended ceiling, which takes the double-layer wooden system as a frame that fully occupies the top. When all the operable pieces are closed, the suspended ceiling forms an integral surface; and when opened, it reveals the inside space. Except for those as air conditioner’s outlets or inlets, all the operable pieces can serve as openings of the upper storage space around. 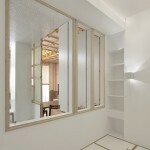 ▼ 吊顶开启部分的两侧可做储藏空间，All the operable pieces can serve as openings of the upper storage space around. A friend of mine visited our home, on entering, he exclaimed:” Wow! You just put the Cloud Ladder onto the ceiling!” Simultaneously with Cui Linglong’s constructing, we built up the Cloud Ladder, a spacial installation for a contemporary art exhibition. 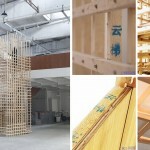 In this Cloud Ladder project, units of wooden bars are orthometrically organized into a cubic tower, in which there are two stairways twisting together, thus viewed in a distance this is literally a Linglong in three dimensions. After the Cloud Ladder had been dismantled, we recycled its wood pieces in our apartment’s renovation, and the Cloud Ladder is literally put onto the ceiling. 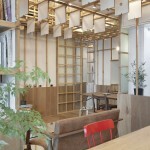 In the wood conjunctions of the Cloud Ladder’s units, wood bars remains intact in their cubic shape and connected with each other by bolts. And we optimized this detail in our apartment by replacing bolt connection by tenon-and-mortise work, and each piece of wood joints another two in their mid points orthogonally. 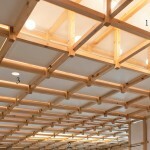 1 Lamps are installed in between the void part of the wood grids and directly illuminate the space below, offering the brightest lighting. 2 Based on 1, a piece of white acrylic board is fixed on each unit’s lower surface as a cover. In the day, only the gentle reflection from acrylic boards tells the difference from surrounding parts; while in the night when lights are turned on, this area becomes a moderate illuminant. 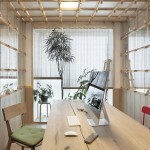 3 Light of lamps goes through plywood boards on which evenly drilled round holes of 5cm. This is the softest lighting that is particularly suitable for seeing a movie. 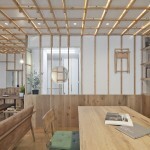 In any case, light beams from the cracks between the wood grids and the plywood boards, turning out to be neat golden lines. 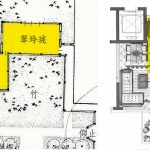 The two entries of the original Cui Linglong in the Surging Waves Pavilion Garden are respectively set in the two rooms at two ends of the space, inside which there’s no doors as further division, so that the only way that Cui Linglong is experienced is linear. 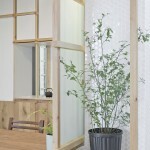 Besides, repeated lattice windows and the bamboos outside them result in a pure sensation. 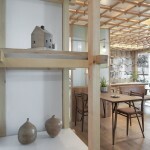 Yet daily life consists of so many trivial details that once the Cui Linglong structure was embedded in our tiny apartment, there have inevitably been 6 entries and several openings on its boundaries, connecting small rooms, the patio and the second floor visually and behaviorally. In this sense，the classic Cui Linglong structure is segmented here. 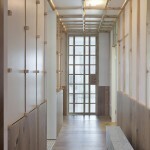 6 Wooden grid door with frosted glass strips that are plied together on the dull-polished side and then vertically installed, which formed a conditionally transparent surface. When looking in front of it, one can have a view of what’s behind with parallel lines on it, and from an angled direction, it looks like verdant jelly, which forms fuzzy images on it and somewhat responses to Cui of Cui Linglong, a Chinese character referring to green jade. 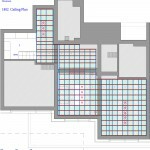 These details have created various visibilities accommodating different degrees of privacy necessities. 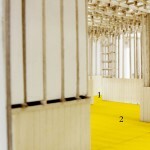 All the rooms relate to each other and have become a whole, into which the fragmented Cui Linglong has merged. My interest in Cui Linglong arose from my college years, when Professor Wang Shu gave us the first lesson on Chinese gardens, which in a sense was also the first architecture we have learned. Before getting familiar with these classic western modern architecture like the Villa Savoye and the Farnsworth House, we first learned about Cui Linglong. I showed our design to my tutor Professor Wang Shu. He described our work as “ generate the sense of large in a small space ” excitedly asked, ＂what will it be like in ten years?＂ My understanding of this question is that since this design had formulated a set of form language of its own, what would this language be like after ten years’ immersion in daily life? Then the word “metabolism” flashed across my mind. This concept basically refers to a Japanese school of modernism architecture that was active in 1950-60s and asserted that architecture should be renewable as organism capable of metabolism. Although the innovative forms of their works have led to rigid results, the concept is still charming, for it goes beyond some certain style or form, and suggests that designing aims at not only a limited result but a process and a system. 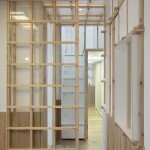 The abstract Cui Linglong provided an attracting start for constructing our home, and the wooden system, a set of form language. 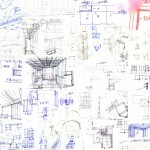 In the process, to design becomes like to sketch, for both involve continually modifications overlapping the present works and finally turn out to be full of traces, a never-finished drawing, and such everlasting project will inevitably deviate from the original envision of the author. As regards this, our opinion is similar to the Portuguese architect Alvaro Siza’s comment in a documentary that he dislikes the moment when a building’s finished, for we hope that our design will always be in progress and never a finished product of some already existing style, because life is always changing, and so do our understandings of it.